After a disappointing meal at East One Seafood Restaurant 食家飯堂, Buddha Boy and I wanted a reasonable-priced mix & match combo dinner 合菜 (和菜). 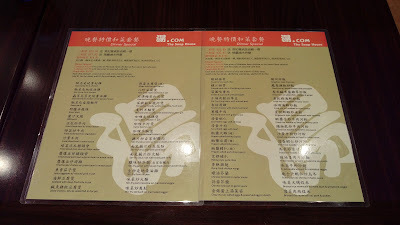 We were lazy and didn't want to go to far from home, but at the same time, we wanted to try somewhere other than our usual neighborhood canteen, Rose Garden Seafood Restaurant 嘉好海鮮美食之家. Flipping through my phone, I came across the food photos from our previous visit to The Soup House 湯.com where we ordered a few dinner dishes on top of pot-rice orders. Well, I think we just decided where we're going for dinner. 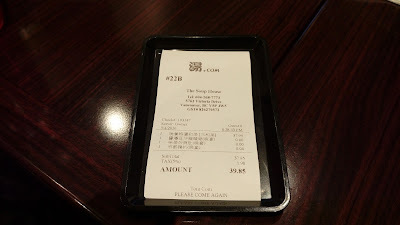 We were served three bowls of house soup because we ordered three items from the Dinner Special 晚餐特價和菜套餐. The soup of the day was Green Turnip & Carrot in Pork Bone Broth 青紅蘿蔔煲豬骨. There was an obvious carrot sweetness in the soup but we couldn't find much chunks of either roots in the bowl. Pork bone essence was evident. After waiting for about twenty minutes, one dish finally arrived...and it was slightly different than what we originally ordered. The Fried Sliced Pork Jowl w/Green Bean in Mixed Sauce 醬爆豆仔豬頸脊 should be with chicken instead of pork cheek. But we were hungry and didn't want to wait any longer, so we accepted the dish. The quality of the beans were not ideal. 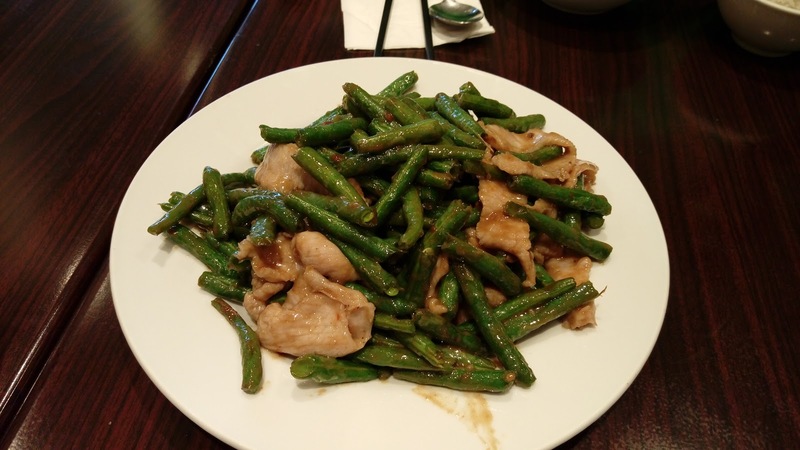 Even after being deep-fried, the green beans were still overly fibrous. The pork was tender while maintaining its chewy and crisp crunch. 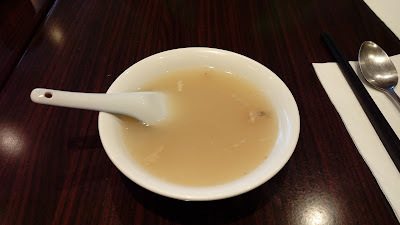 "醬爆" is a common Chinese cooking technique using sweet-bean paste 甜麵醬, however, instead going with the norm, this place used soy-bean paste 麵豉醬 (also known as Chinese miso-paste). If you're eating this with the "醬爆" in mind, you would not find that distinctive sweetness and that mellow fragrance of the sweet bean paste. Instead, the dish was masked with a deviant saltiness and daring aroma of the soy-bean paste. Was this dish enjoyable? For Buddha Boy, yes, since he's a fan of soy-bean paste. For me, I'd prefer going with the classic sweet bean paste. Next came the Peking Style Pork Chop 京都肉扒. The chops, which were first deep fried then tossed in a ketchup-based blend, were tender and meaty. 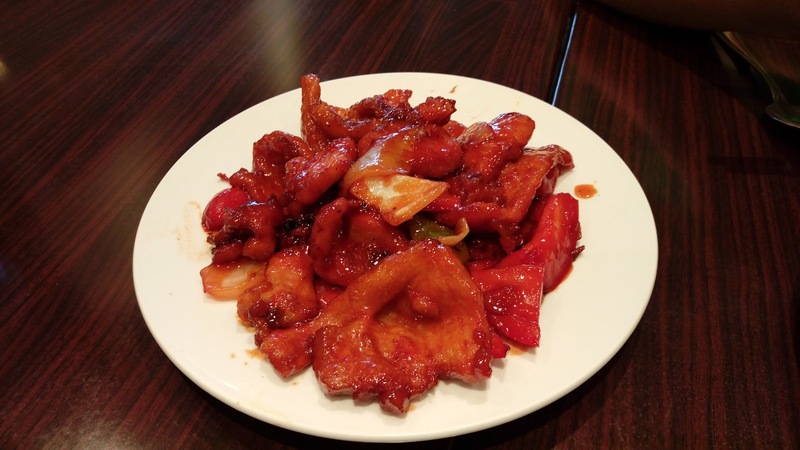 The syrupy sauce had a considerable amount of sweetness to accent the dish without being intrusive. This was our favorite dish of the night. 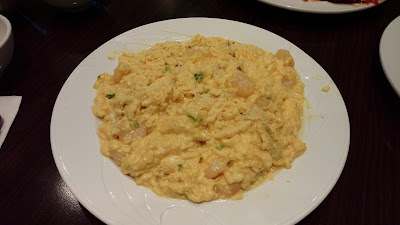 The Scrambled Eggs with Shrimp 滑蛋蝦仁 was a huge fail. The scrambled eggs were not smooth nor fluffy, instead, they were quite broken and wet. The poor quality shrimps were insanely small and lacked texture. And while no burnt pieces were detected visually, the fume was brisk in smell and taste. Because we ordered three dinner specials, we were entitled to a complimentary plate of assorted barbecued/marinated meat. After being verbally given a list of available items to choose from, Buddha Boy opted for Marinated Duck 滷水鴨 and Soy Sauce Farm Chicken 馳名走地豉油雞. 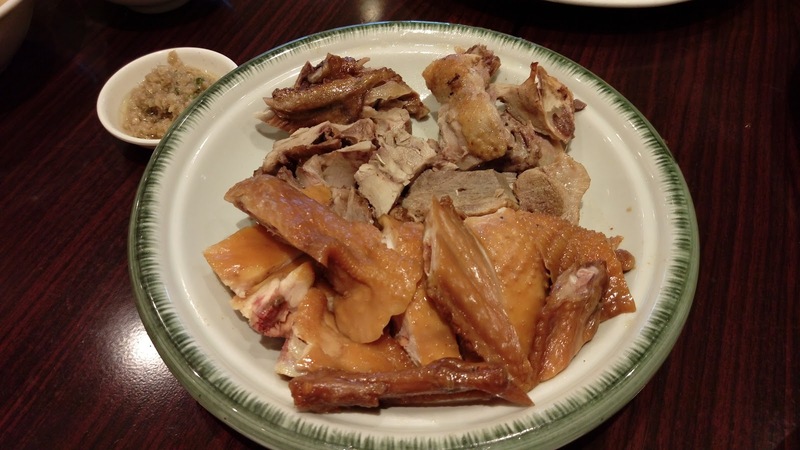 The duck was mostly bone pieces and flavor was flat and weak. The chicken had that common firm meat texture of a free-range chicken, which I'm never a fan of. The overly sweet marinate overwhelmed all the fundamental spices. Service was prompt and neighborly. Prices for the dinner specials were reasonable and the portions were sizeable. Unfortunately, the quality can be hit and miss. After all, this is a pot-rice joint, not really a place for sauteed dishes.